We Live In A Political World: #208 / Killer Robots In Our Future? #208 / Killer Robots In Our Future? 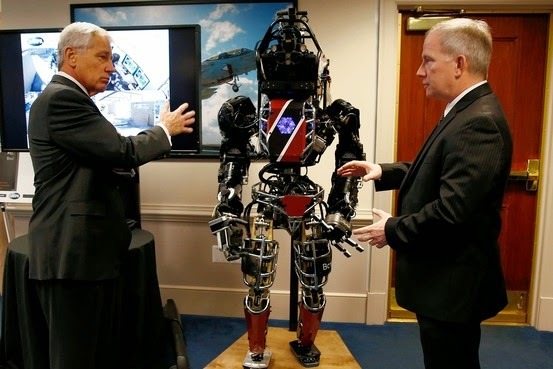 Here is Secretary of Defense, Chuck Hagel, inspecting the latest model of an Atlas "killer robot," developed by the Defense Advanced Research Projects Agency (DARPA) and Boston Dynamics. I saw the picture in an opinion piece by Erik Schechter, published in the July 11, 2014 edition of The Wall Street Journal. Schechter is the author of The Security Guy's Weblog, covering war, terrorism and the military-industrial complex. In The Journal article, Schechter reports that the Pentagon decided in 2012 to "set a five- to 10-year moratorium on developing autonomous weapons systems." He further says that "the U.N. Special Rapporteur on extrajudicial summary or arbitrary executions has likewise called on other states to put their research on hold." Disarmament activists contend that, real-life consequences aside, it is inherently wrong to give a machine the power of life or death over a human being. Killing people with such a self-propelled contraption is to treat them like "vermin," as one activist put it. But why is raining bombs down on someone from 20,000 feet any better? My answer: "raining down bombs on someone from 20,000 feet" is NOT any better than decimating them at close quarters with a killer robot. However, this fact is NOT an argument for killer robots. It is an argument against drone killings. Could we all stop thinking that perpetual war is the "base case," and start moving in some different direction? Your description of atlas as a "killer robot" is 100% wrong. Atlas is intended to aid emergency services in search and rescue operations, performing tasks such as shutting off valves, opening doors and operating powered equipment in environments where humans could not survive. The Department of Defense stated in 2013 that it had no interest in using the robot for offensive or defensive warfare. Next time, maybe do your research, Gary. Just saying. The opinion piece to which I cited used the "killer robots" terminology.